SUMMIT CAST is Sigma Stretch® Film's newest, ultra-premium, one-side cling, up to 300% pre-stretch, cast coextruded film. Easy unwind assures great machinability on all high speed automatics, overheads and bundling applications. Yet the uncompromising state-of-the-art cling package promotes the bonding of all film layers at all prestretch levels, while the no-cling surface offers the ability to maximize warehouse space and cube-out trucks. 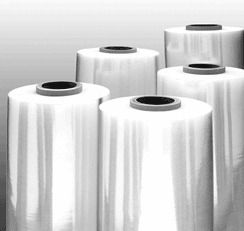 This film offers high elongation, exceptional puncture and tear resistance, along with excellent load-holding force. Thin gauge Summit competes head-to-head with competitor's Ultra-Premium films in many down-gauged applications. Achieve the critical performance that you demand over-and-over again! SUMMIT CAST, the definitive high-volume, high-performance film solution!